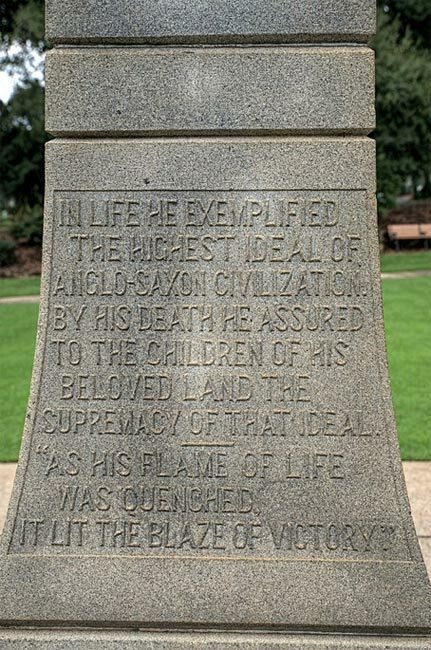 A manicured park located at the helm of North Augusta‘s main thoroughfare – West Forest Avenue – features a monument commemorating the lone white causality of the Hamburg Massacre. As it happens, this violent 1876 event actually left seven men dead, six of whom were black. Though no longer extant, Hamburg was once a thriving community on the banks of the Savannah River. 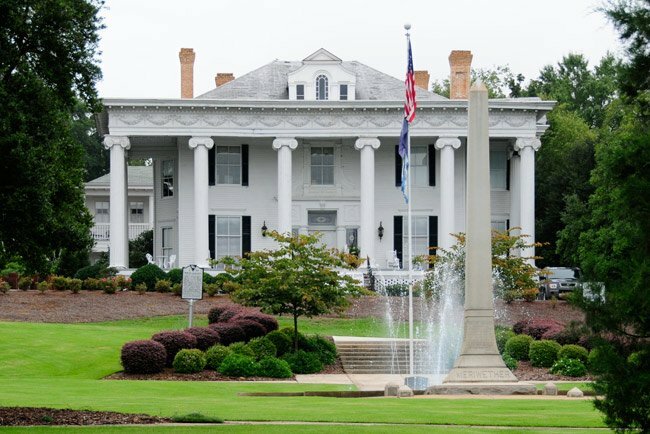 The settlement was founded in 1821 by Henry Shultz, a businessman from Augusta, Georgia – just across the river – who wanted to establish a competing port. Shultz named the village for his birthplace of Hamburg, Germany, and the new town prospered from the cotton trade. When the Charleston-to-Hamburg line of the South Carolina Canal and Rail Road established the town as the line’s terminus in 1833, business boomed. Unfortunately, in 1853, the rail line was extended across the river to Augusta via the Hamburg-to-Augusta rail bridge, leaving Hamburg irrelevant in the world of transportation. The town dwindled in population and was nearly extinct by the Civil War. In 1929 a series of floods caused remaining Hamburg residents to evacuate, and many relocated in nearby Carrsville. Following the war, freed African-Americans settled in Hamburg, founding a municipality and forming a militia: Company A, Ninth Regiment National Guard of the State of South Carolina. The militia had been issued arms by the state under Governor Robert Scott. The presence of an armed black militia in South Carolina – the members of which were Republicans – upset local white Democrats who were plotting to defeat the sitting Republican governor, D.H. Chamberlain, in an upcoming gubernatorial election. On July 4th, 1876, the militia marched on a public road in celebration of the nation’s centennial. Two white farmers appeared in a wagon during the parade and ordered the militia to cease its drills so they could pass. The captain of the militia, Doc Adams, explained that ample room existed on either side of the formation, but eventually the militia parted, allowing the wagon to proceed. Adams was arrested the following day for blocking a public road. When Adams attempted to access the courthouse for his hearing on July 8th, he was met by an armed group of white men. Adams then sought cover in the militia’s armory, where he was joined by forty of his men. The armory soon was surrounded by more than 100 armed men who demanded that the group surrender its arms. The militia declined, arguing that its weapons were rightfully issued by the state. Upon this refusal, bullets were fired. McKie Meriwether and at least one African-American, James Cook, died during the exchange of gunfire. The black soldiers attempted to flee but two dozen were captured. Some time later five captives were hauled out and executed: Allan Attaway, Albert Myniart, Moses Parks, David Rivers, and Hampton Stephens (some accounts say two were killed fleeing the scene and four were later executed). 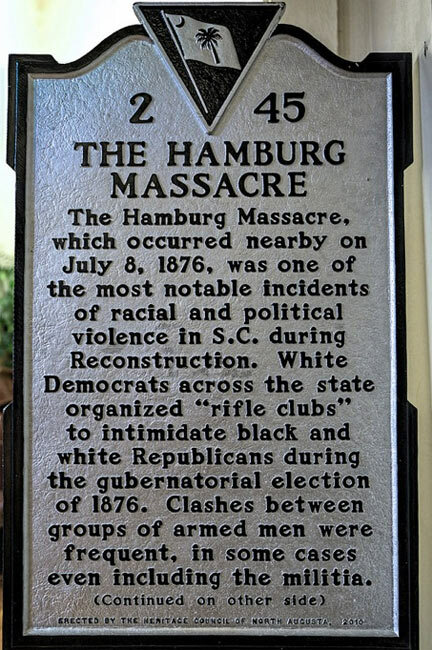 The Hamburg Massacre, as the tragedy came to be known, galvanized the state’s Democrats and further ignited the Red Shirts in South Carolina, a paramilitary group dedicated to the election of Democrats and the eradication of Republicans, regardless of whether they were black or white. “Pitchfork” Ben Tillman – governor from 1890 through 1894 – was instrumental in leading the Red Shirts that summer and fall. As a result of the political efforts of the Red Shirts and other Democrats, Wade Hampton was named governor in what is now widely considered the most corrupt election in South Carolina history. 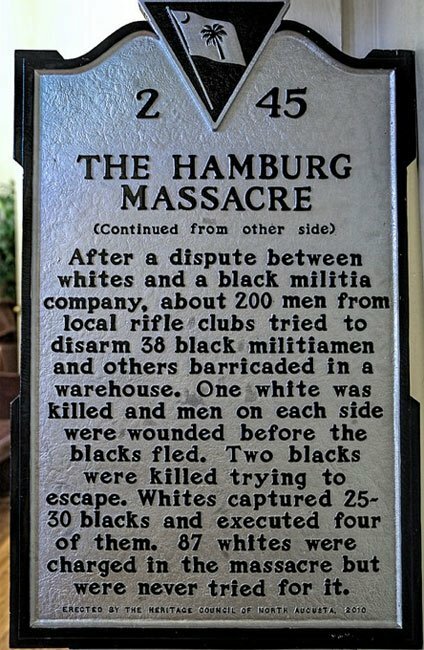 Eighty-seven whites were charged in the massacre, though following the November election, they were never tried. 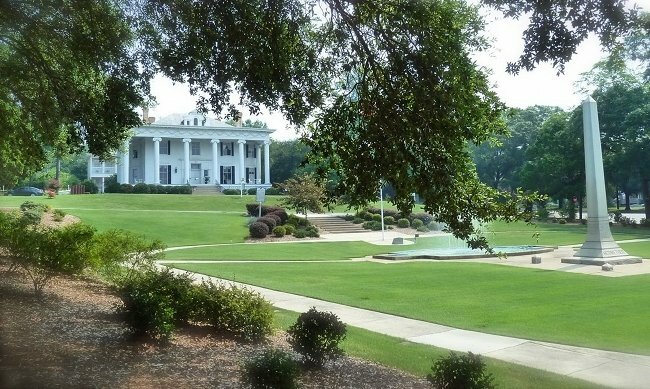 Hamburg eventually disappeared, and its borders were incorporated into North Augusta when the city was established in the early twentieth century. 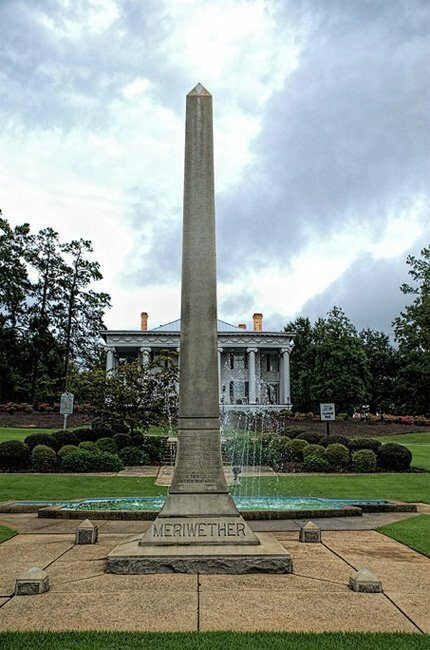 In 1916 South Carolina’s General Assembly erected the obelisk to McKie Meriwether in the heart of the new town. The monument remains even to this day. 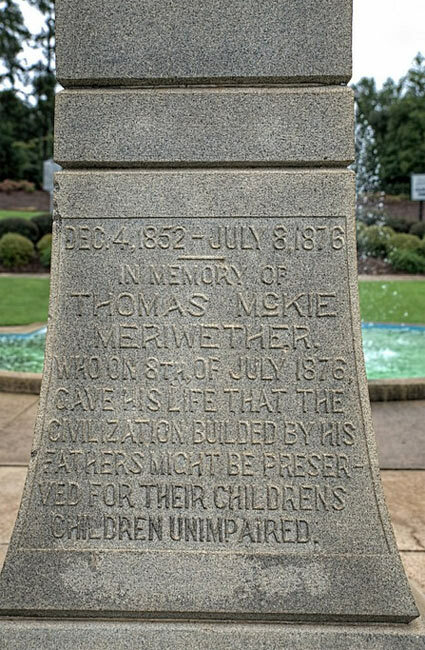 In Memory of Thomas McKie Meriwether Who on 8th July 1876, gave his life that the civilization builded by his fathers might be preserved for their childrens children unimpaired. 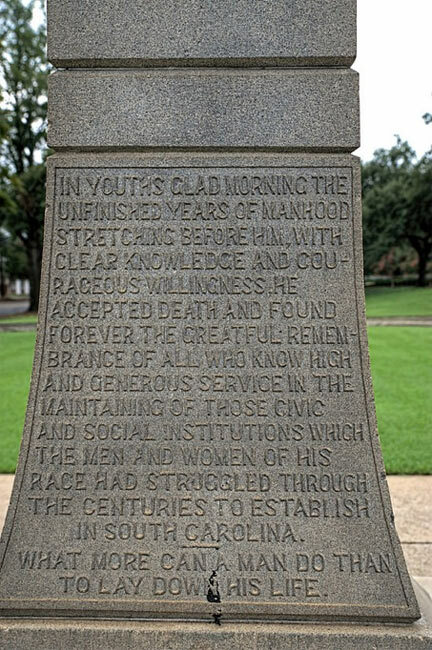 In youths glad morning the unfinished years of manhood stretching before him, with clear knowledge and courageous willingness, he accepted death and found forever the grateful remembrance of all who know high and generous service in the maintaining of those civic and social institutions which the men and women of his race had struggled through the centuries to establish in South Carolina. What more can a man do than to lay down his life. 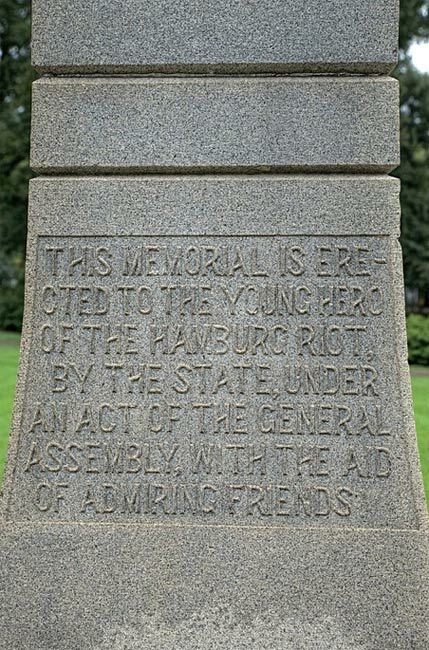 This memorial is erected to the young hero of the Hamburg Riot, by the state, under an act of the general assembly, with the aid of admiring friends. For nearly a century, no marker nor monument recognized the six black men who died. 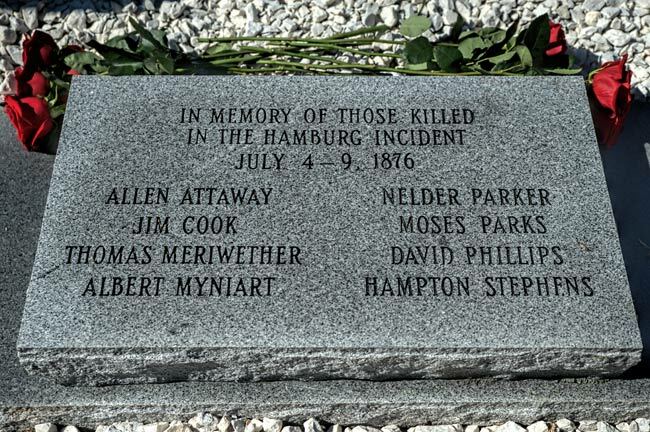 In fact, in the 2006 celebration of the city’s centennial, McKie was described in literature of historic sites as “the only resident of Hamburg to be killed in the Hamburg riot of 1876” – a glaring omission at best. In recent years many have noted this injustice, and in 2011 an historical marker was finally unveiled, though it was not yet installed. For five years it stood on display in First Providence and Second Providence Baptist churches. 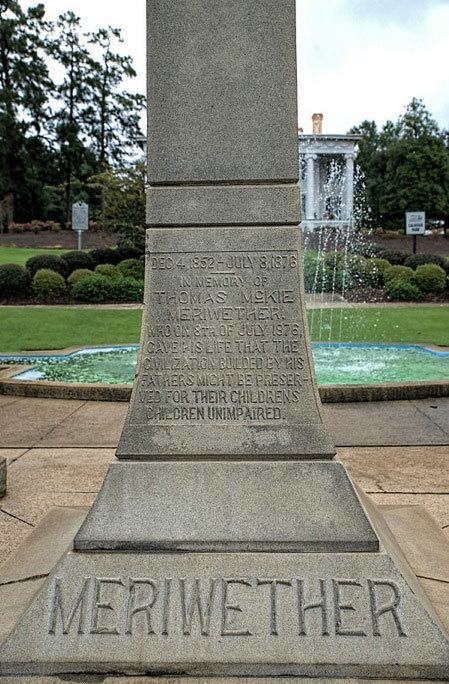 Unlike Meriwether’s granite obelisk, which was commissioned by our state legislature, this simple marker (seen above and below) was sponsored by the Heritage Council of North Augusta, a local non-profit organization. Finally, on March 6, 2016, the Hamburg Massacre marker was unveiled. The marker was originally planned to be displayed at the Fifth Street Bridge in North Augusta. However, the location of the marker was changed after concerns about potential vandalism of the marker were raised. 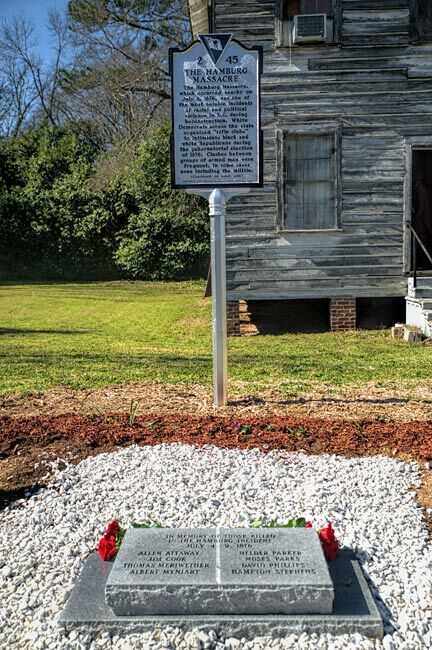 Instead, historic Carrsville was chosen as the site for the marker. While the marker relays the story of the Hamburg Massacre, the granite memorial seen below, which was also unveiled in Carrsville, lists the names of the victims. Included are not only the seven African-Americans killed in the event, but also McKie Meriwether, referred to in the memorial by his first name. We have been looking into this, do you have a record that the marker was erected in Hamburg for Cantey? We haven’t been able to turn much up just yet. Thanks so much for the information! We corrected the error. Hello, my name is Caitlin Farmer, I am from Early College High School in Horry County. I am working on my National History day project and my topic is the Hamburg Massacre, I would like to use some of these photos for my website. I will cite this website. Please reply!!! Local History. I love to learn history so we don't have to repeat mistakes.